6 Tips for Getting Ready for Back to School! August 6, 2018 August 6, 2018 Abby H.
It’s coming… For some of us, back to school is NEXT WEEK! For others it’s later in August, and some lucky folks, have until Labor Day in September. Regardless of when your kids go back, it’s nice to be prepared and save money. Here are a few ideas to help you prepare and stay on budget! Packing an Awesome School Lunch. Shop Online to Save Big- I love shopping online, especially at JCPenney and Kohls. Lots of great deals to be had, coupons, and ship to store to save even more! There is a backpack and school supply giveaway in Santee on August 19th. More info here. If you need school supplies sooner, Assemblywoman Dr. Shirley Weber is sponsoring a Back to School Kick off and Community Health Fair on 8/11/18. If you are worried about being able to provide a nutritious, healthy lunch for your kiddos, The San Diego Food Bank sponsors Neighborhood Distributions throughout the month all over the county. You can go and get free, fresh produce- usually between 10-30 lbs. per family. No proof of need- Just grab your reusable shopping bags and go! Adjusting back to the school-year schedule can be a little tough- That’s why we start to get the kids back to bed at their regular time starting the beginning of August. For our kiddos, keeping them busy and active all day, really helps. Trips to the playground, beach, zoo, and pool really help. We’ll be hitting up the night time zoo this week! And one last back to school tip: Let your kids play and hang out with friends as much as possible before they go back, especially if they aren’t able to see some of their friends at school. We’re hosting a K’Nex Play Time Party with Tryazon this Wednesday at Shadow Hill Park in Santee! If you and your gang will be in the area, please stop by! There will bea chance to win prizes, yummy snacks, and cool toys! Free Admission to Sea World for Active Duty Military & Veterans! Did you know that active duty military and veterans can receive up to four free passes to Sea World (also selected Busch Gardens and Sesame Place)? It’s true! Sea World has a program called Waves of Honor. Waves of Honor permits any qualified active or former U.S. military service member to one complimentary admission per year for military personnel and as many as three guests. This isn’t available at the park, so you’ll have to sign up here and fill out all the forms before you go. Parking isn’t included in this offer and starts at $17, depending on which park you visit and what level of parking you select. This offer is limited in time. Offer available online through September 30, 2017. Visitation must take place by December 30, 2017. If you qualify and want to take advantage, do it sooner rather than later! July 26, 2015 July 22, 2015 Abby H.
Today we’re going to talk about saving money inside the park. Specifically FOOD, but also souvenirs and other goodies. I like most of the food choices at Disneyland (OMGoodness Gibson Girl Ice Cream), but it can get a little expensive. So here is what we do: Rent a locker and bring a picnic. I pack a soft side cooler (like this one from Thirty-One) with a few frozen water bottles, lunch meat, fruit, frozen yogurts, and a small re-usable grocery bag with bread, individual packets of condiments (you can buy them at Smart and Final), and Ziploc bags with snacks, and we put all this stuff, plus our jackets and a few other misc. things into a locker. There are various picnic areas inside the park (there is one up by Big Thunder Mountain, and various tables and benches scattered throughout the park), as well as one right outside the main gate by the large lockers. For snacking during the day, I pack snacks that fit in our pockets (we both usually wear cargo shorts) like bags of pretzels, hard candy in Ziploc bags, and a 16oz. or so size bottle of water that we refill at the various water fountains throughout the park. 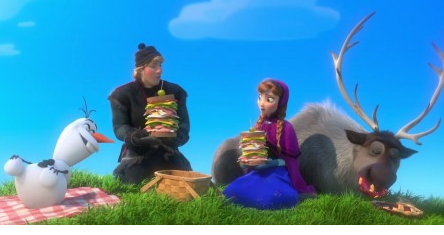 We’ll stop back at the lockers for fruit or a larger nosh if we’re nearby and hungry. That doesn’t mean I’ll go without my beloved Ice Cream. We usually pick one treat a day and share it. Ice cream, frozen banana on a stick, Dole Whip…. Whatever we both can agree on. We also save money by buying our Disneyland shirts before we go on vacation. The Disney Store usually has an end of summer sale, and I can stock up of D-land shirts for 50-75% off retail prices. The mall closest to our house has a Disney Store, so we cruise in frequently (Lil’ Man is obsessed with Mickey Mouse). Other Disney Souvenirs like sippy cups I’ll buy in advance and sneak in our bags so he doesn’t see them until we arrive. In the past, I have scored a sweet new Disney shirt for $2.00! 99 Cents Only has a great selection of Disney Branded and Licensed items like crayons, coloring books, sippy cups, sandwich boxes, and other lunch/food storage containers. I’ve been sneaking 1 or 2 items into the cart each week when Lil’ Man isn’t looking! We also set a budget when we go on a trip and stick to it. Bring cash with us each day of the trip, and when it’s gone we’re done spending. It’s just that simple. July 23, 2015 July 22, 2015 Abby H.
I am really bothered by all of the mis-information that is available online surrounding the discounts available for Disneyland passes. So, today’s installment in the vacationing as a cheapster is going to cover discounted Disneyland tickets. I’m going to break it down this way: first the myth, then the truth. 1- Just have your dad/mom/friend/uncle’s cousin’s brother who is/was in the military buy you tickets at the discounted ticket office on base and use those. Waa waa waa- That’s the sound of the saddest trombone. Our local ITT (information tickets and travel) office at MCAS Miramar says that’s no dice. From their website: “Name of sponsor or spouse will be printed on all tickets & that person must be present all days.” So, unless your dad/mom/friend/uncle’s cousin’s brother is coming with you on your family vaca, think again. If you are a military family, ITT is a great way to go when buying tickets. 2-I’ll just join AAA and get discounted tickets through them! I’ll be saving big bucks in NO TIME!!! If you are joining AAA just for the Disneyland discount, think again, my friend, you may not be saving any money. Annual membership in AAA is $48.00 plus there is a New Member Admission Fee of $20 (for the first year only). Depending on which type of ticket (number of days and which parks) and number of tickets you are purchasing, you will save approximately $4.25-$7.75 per ticket. So if you are purchasing multiple multi-day passes OR multiple annual passes, it might be worth it. Bottom line- If you are already a member of AAA, this is a good deal! 3-I’ll just buy a ticket from someone on Craigslist. There is always someone selling the remainder days on the their multi-day pass on Craigslist. Please don’t. Here is why. The pass has the sellers name on it. The nice cast members working at the gate have the right to check your ID against the pass. The names don’t match? Guess what? They’ll confiscate your ticket. This was confirmed by a friend who is a cast member after reading some horror stories I read online about this. This may NOT happen, but do you really want to chance your family vacation to save a few bucks? So how DO you get discounted passes? Well, many unions, fraternal organizations, student unions, and businesses offer discounted passes for sale. Ask someone in the organization’s office. You can buy legit discounted passes online from aRes Travel (I found them through Mousesavers.com). They offer tickets to a lot of Orange County and Los Angeles area attractions for a discount, however, they do charge a $4.00 convenience fee. So it may only be worth it to you if you are buying multiple passes. There is still time!! 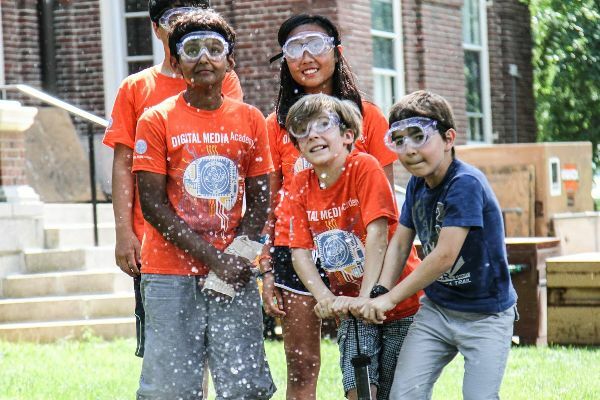 Save $75 off summer camps at Digital Media Academy! May 26, 2015 Abby H.
If you are still looking for a fun summer camp for your teen this summer, Migital Media Academy is still offering their sweet deal! Founded at Stanford University, Digital Media Academy is ranked as one of the ten best summer camps in the world. 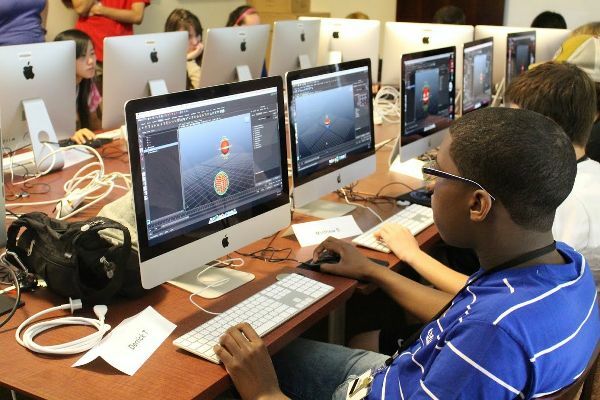 Save $75 off summer camps at Digital Media Academy with code TECHSUMMER at http://www.DigitalMediaAcademy.org. Sign up for multiple weeks and save big! Campers save $125 for each additional course they register for. Register by June 30th to #CreateTheNext best-selling app this summer! May 13, 2015 Abby H.
A shot of us at D-land in September of 2013! I was cleaning out some files yesterday and I came across some notes from when we planned our family vacation to Disneyland 2 years ago. I know with Summer vacation coming up, a lot of you will be planning trips to The House of Mouse and other locales. Here are a few tips to help you save on your summer fun! The first part of planning a trip is budget. Where you’ll go, how long you’ll stay, what you’ll do while you’re there, those things are all (sadly) dictated by budget. We’re getting a m/hotel room with a kitchenette. That way we can eat some meals in room and save money. The average price per person per meal in most tourist areas is $10.00 plus tax and tip, so just by eating in our room three times we’re saving $90.00 plus tax and tip. The difference in price between a m/hotel room without a kitchen is about $10/day. For us, it’s worth it. I use as many deals and savings programs to earn gift cards and cash to defray costs. I’m save Swagbucks for a Paypal payout, I save Mypoints points for a gift certificate or a Paypal payout, And if we happen to eat out, we’ll try to eat at Mogl restaurants to earn a little green back! So with our budget in mind, I set to finding a m/hotel that fits our budget and has the amenities we are looking for: swimming pool, complimentary continental breakfast, and free parking.